One of our goals is to help you learn how to trigger your fat-burning hormones, this gives you the most effective leverage over fat-burning hormones. Your fat-burning hormones work through your liver - that’s why it’s so important to do a cleansing program two to four times a year. 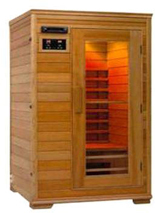 An essential part of cleansing and detoxifiying your body is utilizing an Infrared Sauna. nfrared is the band of light you perceive as heat. You can’t see infrared with the naked eye, but you can feel this type of light in the form of heat. The sun produces most of its energy output in the infrared segment of the light spectrum. Infrared rays heat your body without having to heat the air around you. Your body expends energy (calories) to produce sweat - 1 gram of sweat requires approximately 0.586 calories. A moderately-conditioned person can easily sweat of 1000 grams or more in one Infrared Sauna session. That’s the equivalent to running 6-9 miles! While this weight loss can be regained by rehydration with water, the calories expended in the process will not come back. Sweating also allows the body to release built up toxins naturally, keeping your body cleansed even when not on a cleansing program. What is the Difference Between an Infrared Sauna and the Conventional Sauna at my Gym? Whereas conventional saunas transfer heat by circulating hot air to warm your body from your head down, infrared saunas warm your body directly. This allows an in-depth heat in a more pleasant temperature, thus providing more health benefits and a highly enjoyable and comfortable environment. Call our office today or sign up for a FREE Weight Loss Seminar to learn more about this and the many other services we offer!